Drying fruits and vegetables, meat and fish, and is one of the oldest and most healthy ways to preserve food. Although, there are many methods for drying food, this one successfully delivered to the present day. How to dry fruit, vegetables, meat and fish at home, what is the dehydrator for drying fruits, what are the health benefits of these methods and how to properly use dried food for cooking, find out below. Among various preservation methods, which are based on the principle of reducing the water content, drying of fruit, vegetables, meat and fish is the most traditional and probably the oldest method of food preservation. The procedure was based on the exposure of food to the wind and sun, as practiced today, where climatic conditions allowed this method. Today, we use modern devices (food dehydrators) since they mimic and improve the natural drying conditions, that is applied to the heat and air flow. Only in the middle of the last century technologies such as food preservation have become more developed. Drying may be exposed to any of the ingredients, but the most common are the fruits and vegetables - potatoes, carrots, cabbage, asparagus, peppers, celery, mushrooms, peas, tomatoes, green beans, apricot, apple, fig, plum, peach, pear, grapes. Meat and fish remains substantially dry in the rural areas, while the drying of fruits and vegetables can be made everywhere. IS DRYING OF FOOD HEALTHY? Without water there cannot be any form of life, which means that dehydration completely and permanently stops the activity of microorganisms in food. One advantage that dried fruits and vegetables have compared to other types of preservation is that dried foods can be re-hydrated and used as fresh, without compromising the quality. On the contrary, the food during drying improves their natural aroma and has a higher sugar content. Drying preserves important nutrients which are during cooking permanently lost, and in contrast to freezing of food, it minimally changes the quality of food or the content of vitamin A (beta carotene), nutritional fiber, saccharides, potassium, selenium, magnesium and sodium does not changes or only very slightly is reduced. Calorific value of dried food remains the same or are increased, while the percentage of salt and fat is slightly lower. Dried fruit can be eaten instead of purchasing snack foods, which contains a lot of cholesterol and artificial additives, and should be avoided. Also, it can be used to make cakes or compote, adding a little of lemon and honey, which is a real winter vitamin bomb. Drying fruit is an excellent method of preservation, but calories must be taken into the account. 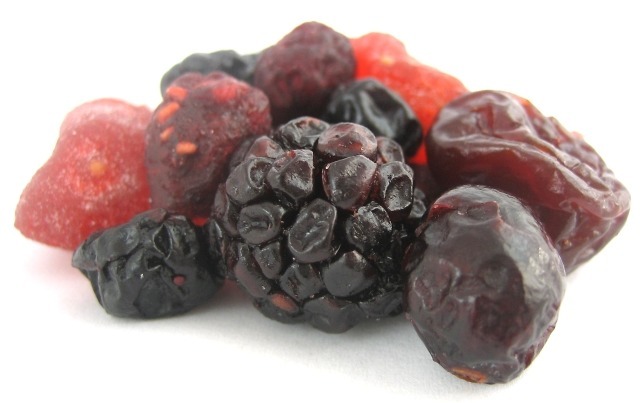 A serving of dried fruit or vegetable has twice the calories of regular fresh fruit. So cup of fresh chopped apples is equal to half a cup of chopped dried apples - bear this in mind, especially if you are on a diet. The same applies to dried apricots, plums and any other fruits. In preparing cakes count the fact that the dried fruit is a lot sweeter, so you will need less sugar. Food that is dried has a longer shelf life than the one that is otherwise preserved. If packaged in a good vacuum, it can last up to 20 years. Thanks to a small volume, dried food in the pantry or on the shelf do not take up a lot of space. Let us remind ourselves that homemade dried herbs and spices when cooking have a lot stronger flavor, which does not apply to those which are industrially processed. How to dry fruits and vegetables? Drying of fruit is not a complicated process, as it might seem at first, and the most important thing is to prepare the food well first. Bear in mind that fruits are healthy and mature, and well washed. Pears and apples can be peeled or not after which are then cut lengthwise into four to eight parts, or on the rings with a thickness of half to one centimeter. Peaches and apricots can be peeled off, but it is better not to do it because they lose less juice like this. Just halve them and remove their seeds. Preparation of vegetables: for drying vegetables, fruits, select what you would normally use to prepare lunch - fresh and undamaged.do not use rotten fruits. Vegetables should be thoroughly washed, cleaned and cut lengthwise. Large pieces cut across the width so that they are all or similar size so they can evenly dry. Vegetables are cut on a wooden board preferably, a knife of high-quality stainless steel to avoid oxidation. Vegetables before drying can be blanched: Slices are placed in boiling water or steam, and are removed before they soften too much. You should keep in mind that everything of this may be equally exposed to high temperature. This is to prevent deterioration, and also shortens the time of drying. Dried vegetables are used to prepare soups, sauces or stews in the usual way, while the mushrooms are ideal for salads, pies or soup. This method is the simplest. Put the fruits in a sunny place, preferably on the south side, preferably on a wooden base, because the metal oxidizes, darken and take on an unpleasant smell. If the sun is strong, then the fruits have to be shaken or mixed several times a day to dry fruits evenly. When they are almost dry, move them to the shade, where they will be lighter and more fully dry. It is best to leave them three days in the sun (all day), and one day in the shade. This method has its advantages, because in this way, fruits and vegetables can be dried when it is not sunny, but care should be taken that oven is never overheated. If the temperature is above 80 ° C, on the surface of the fruit hard crust will form, through which heat is hard to break, and the fruit will rot much faster. The best temperature for drying fruits and vegetables is the one between 33 and 60 degrees, and during this process you must repeatedly stir and mix the vegetables or fruits so they evenly dry. The oven door should be occasionally opened to release the moisture that accumulates in it. Drying of food can be done on an ordinary kitchen pan, only on it put baking paper. Third, fastest and most efficient method for drying fruits and vegetables is the food dehydrator - apparatus for drying food. It dries foods at a temperature at which the food retains its nutritional value. Most fruits and vegetables before drying process should be blanched. Drying in a dehydrator, became a real hit, and offer on these devices is getting better. Inform yourself about the kind of quality and see if the price matches. Not all devices are the same and quality is also not the same. The best sources of information, can be found on the Internet, so you can find reviews for almost every product before buying. Drying of fruits and vegetables is now easily implemented at home, with one of the three ways that we have listed. Drying fish and meat is somewhat less prevalent in urban areas, and this work is done more often with rural households. To dry the meat in the oven, you can use pork, turkey or beef and salmon. Make sure to remove excess fat, and cut meat into thin strips or thin small steaks (that is why it is best that before cutting the meat it is half frozen). Marinade is required: you can choose the simplest - a mixture of olive oil, balsamic vinegar and sea salt, and the marinated meat should spend 24 hours in the fridge. You can add pepper, hot peppers, soy sauce, garlic or other spices if desired. The ideal temperature for drying the meat in the oven is 70 degrees, so do not bake it, but gently pull moisture from it. It is directly placed on the wire, and bellow it always put the pan to collect the liquid that meat is released during drying. How long this process will last depends on the oven, but also on how you cut the meat (usually 2 to 5 hours). Check it after 90 minutes and then every half an hour. Meat should preferably be dried as soon as possible in order to prevent bacterial growth. Also, drying in the oven means that you open the door slightly, and the meat is certainly done when it takes on a brown color and becomes hard and dry. The fish must be well cleaned, rinsed and left on the surface so the water drains. Then add salt and put into a wooden pot, which is then capped with an appropriate wooden cover, and then put a stone on it and press it and leave it to stand for 48 hours. After that, the fish should be removed, strung together on rods, washed a little with water and hang to be dried in the sun or draft for 10-14 days. We hope that our article for drying fruits, vegetables, fish and meat was useful, and if yes, recommend it to your friends.